Here are some facts about Queen Elizabeth II. Queen Elizabeth II has been the Queen of England since 1952. She is also the Head of the British Commonwealth and Supreme Governor of the Church of England. On September 9th 2015, Queen Elizabeth II became the longest reining UK monarch. She has ruled for 63 years, beating the reign of her great-great grandmother, Queen Victoria, who also reigned for 63 years. Queen Elizabeth II was born in London in 1926, and was married in 1947. Her coronation took place in Westminster Abbey, with the ceremony shown on television for the first time. 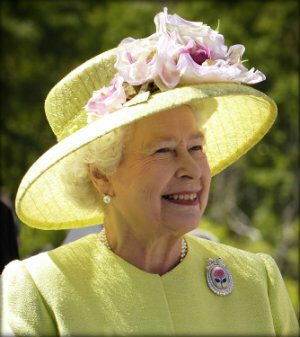 The Queen has visited almost 120 countries during her reign, including over 20 visits to Canada. She does not need to carry a passport. In 2012, she celebrated 60 years as Queen. The celebrations included a flotilla of boats on the River Thames, and a concert with performances by Tom Jones, Paul McCartney and Cliff Richard. The Queen and the Duke of Edinburgh have sent about 45,000 official Christmas cards during the last 60 years. She has answered about 3.5 million letters. The Queen still likes to drive herself sometimes and learned how to repair car engines during World War 2. She is the only person in the UK who can legally drive without a registration number or licence. Queen Elizabeth II has a bank account at the exclusive bank Coutts, and there is an ATM in Buckingham Palace. She is one of the world’s richest people with a fortune estimated at 500 million pounds. During her reign, Queen Elizabeth II has been given many gifts, some of them unusual. She has received a grove of maple trees, 2 black beavers, a sloth and 7 kg of prawns. The Queen has opened over 12 bridges in the UK, and launched over 20 ships. She has posed for over 120 official portraits and enjoyed almost 100 state banquets. Queen Elizabeth II has four children, Charles (Prince of Wales), Andrew (Duke of York), Anne (Princess Royal) and Edward (Earl of Wessex).